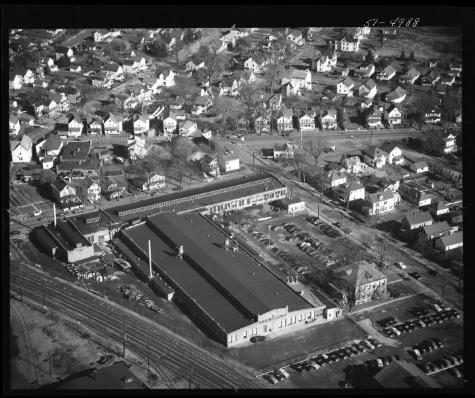 View of a factory owned by Electrol, Inc. The location is not identified on original, but is Kingston, Ulster County, on the southwest corner of Ten Broeck and Grand Streets. Electrol Inc., a manufacturer of aircraft hydraulic equipment, operated a factory there during World War II. Source: New York State Archives, Aerial photographic prints and negatives of New York State sites, 1941-1957, B1598-99. Box 6, no. 76.